What is it like to personally meet a member of the Royal Family? 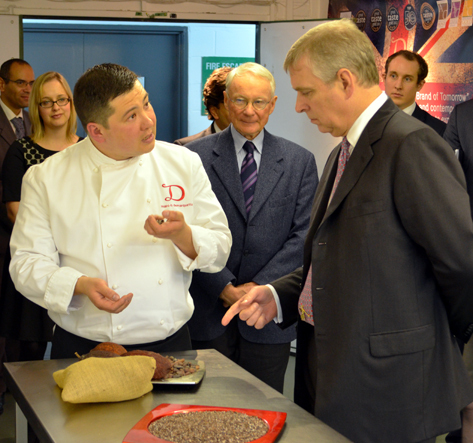 We were honoured to find out on Thursday, 14th February as we welcomed His Royal Highness The Duke of York, KG to the Demarquette Chocolate Production Lab in London as part of his ongoing effort to recognise and support small businesses and entrepreneurs. His Royal Highness was briefed and updated on our success and humanitarian work with cocoa growers in Vietnam, as well as our many initiatives to promote British luxury manufacturing at home and abroad. His Royal Highness was interested to learn that we were named a ‘British Luxury Brand of Tomorrow’ by The Walpole organisation in 2012 and also represent the British Chocolate Industry as UK Ambassador for the International ‘Salon du Chocolat’. 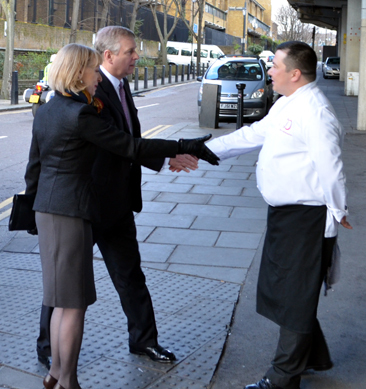 The Duke of York went on to meet other members of the Demarquette team and special guests from Fortnum & Mason, The Westway Development Trust and The Walpole. During a tour of the production facility Marc showed him the meticulous artisanal processes we use to make our award winning chocolates. Since launching the company in 2006, we’ve been proud to be pioneers in the introduction of unique and rare cocoas to the UK market. In early 2010 we became the first British chocolate company to introduce Vietnamese cocoa from the Ben Tre region to the UK and the first chocolatier to be awarded two triple gold star awards from the Guild of Fine Food for the chocolate’s superior quality. His Royal Highness was particularly interested in learning how our investment in cocoa beans from the Vietnamese Cocoa Cooperative (Vietcacao) has helped finance the first phase in establishing a long term vocational rehabilitation centre at a school for handicapped children in Ben Tre. So far our partnership has contributed to the construction of a brand new building on the school’s premises. ← Valentine’s Day Traditions–How Will You Celebrate?